These have been fun to make. 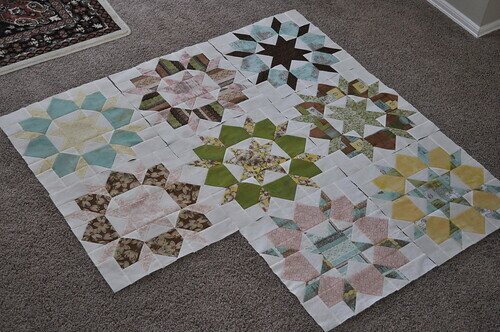 The last block will be blue and green (with some pink) and is already cut out. Guess I'll get to work on that one right away. How's your day going? Just Beautiful! I received my pattern based on your blocks. I sure love your fabric choices. You're so close now... these look lovely all together. I think your Swoon is my favorite so far. It's lovely! I love these blocks! I'm really anxious to make a quilt like this. Yours is beautiful!